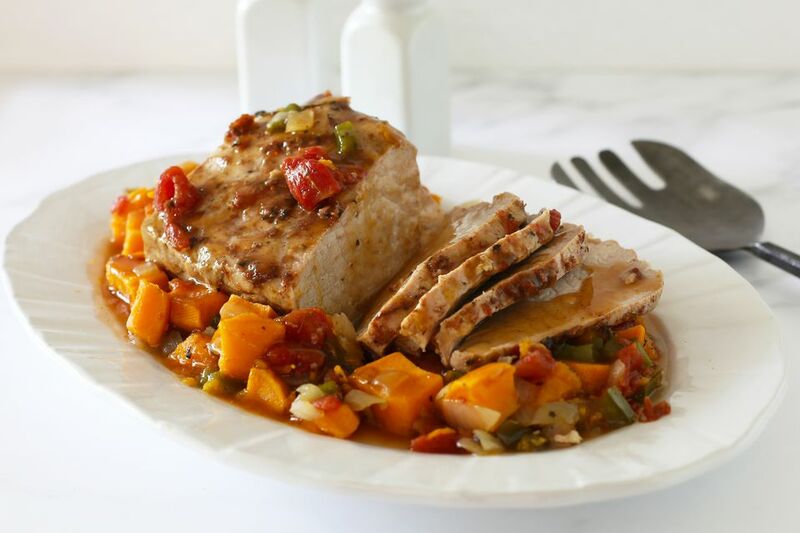 Pork and sweet potatoes go together nicely, and this dish is a great example. Diced tomatoes are blended with a bit of cinnamon and brown sugar, making a tasty sauce that complements both of the main ingredients. Because of condensation, the slow cooker produces a good deal of moisture over the long cooking time on the low setting. If cooking on the high setting, or if your slow cooker tends to cook quite hot, add about 1/2 cup of liquid, such as chicken stock or tomato juice. Prepare the vegetables. Peel the onion and chop. Slice the bell pepper lengthwise; remove the seeds and ribs and chop. Peel the sweet potatoes and cut into 1-inch pieces. Lightly oil the slow cooker or spray it with nonstick cooking spray. Pat the pork roast dry with paper towels; trim and discard excess fat. Place the pork in the slow cooker. Arrange the sweet potatoes, bell pepper, and onions around the pork. In a bowl, combine the tomatoes, brown sugar, cinnamon, and black pepper. Stir until well mixed. Spoon the tomato mixture over the pork roast and vegetables. If the tomatoes aren't very juicy, add about 1/2 cup of chicken stock. Cover the pot and set the slow cooker to 3 hours on high or 5 hours on low. If you want the pork to be falling apart, add an hour to the low setting or about 1/2 hour to 45 minutes to the high setting. When the dish is ready, arrange the pork and sweet potatoes on a platter and keep warm. Drizzle juices over the pork and vegetables just before serving. For a thicker sauce, strain the juices into a saucepan and place it over medium heat. Combine 1 tablespoon of flour with 2 tablespoons of cold water; stir into the juices and cook the sauce for about 2 minutes, or until thickened. Drizzle the sauce over the pork and vegetables or serve it on the side. If using pork tenderloin in this dish, check for doneness after about 3 hours to avoid overcooking. Very lean meat will become tough if overcooked. Creole-Style Pork and Sweet Potatoes: Replace the cinnamon and brown sugar with about 1 1/2 teaspoons of Cajun or Creole seasoning, or to taste. Italian Pork and Sweet Potatoes: Replace the cinnamon and brown sugar with 1 teaspoon of garlic powder, 1 teaspoon of dried basil, and 1/4 teaspoon of dried oregano. Chili-Seasoned Pork and Sweet Potatoes: Replace the cinnamon and brown sugar with 2 teaspoons of chili powder, 1/2 teaspoon of ground cumin, and salt, to taste. Garnish with some chopped cilantro, if desired.